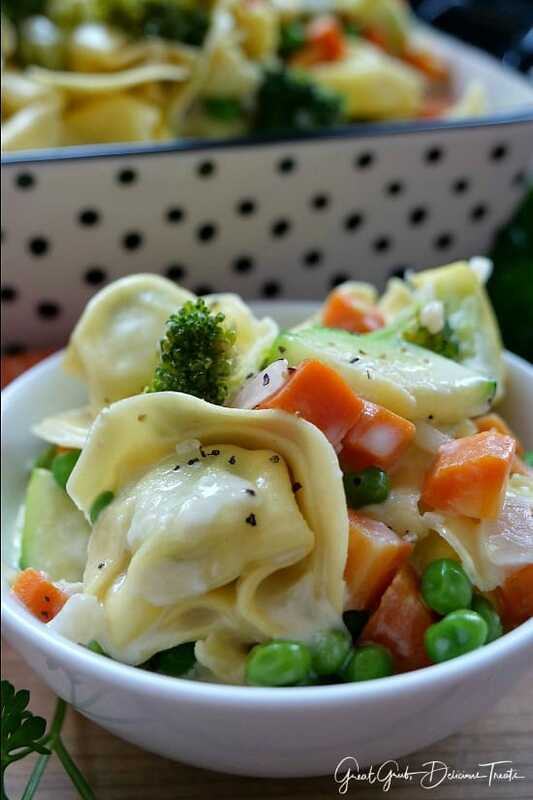 This incredibly delicious spinach ricotta tortellini primavera is loaded with spinach and cheese stuffed pasta, fresh vegetables, a creamy parmesan cheese sauce and makes mealtime a breeze. A quick and easy meal which is perfect for those busy weeknights and can be on the table in about 30 minutes or less. 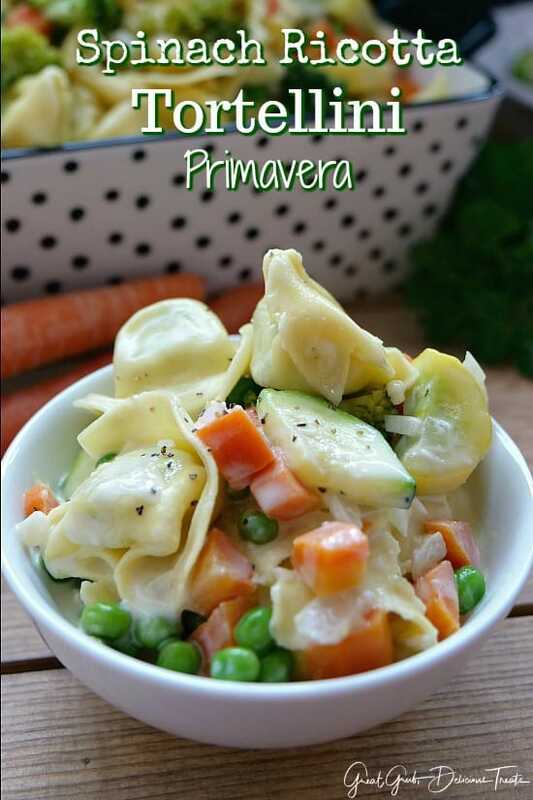 With all the fresh vegetables available, this tortellini primavera can be made with all sorts of different varieties of healthy veggies and is a delicious vegetarian meal perfect for spring and summer. Light, refreshing, super easy and a perfect meatless meal. 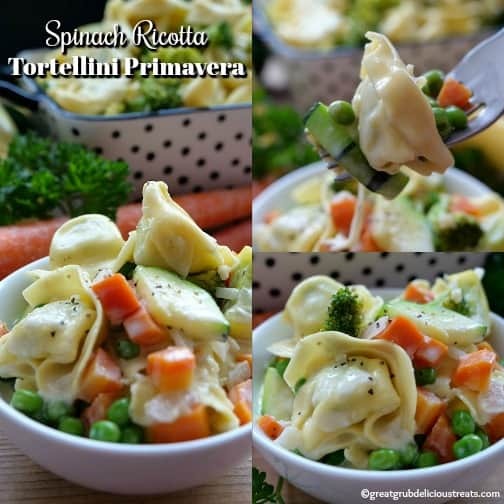 Even though this spinach ricotta tortellini primavera is quick to make, it is also a great meal for entertaining that is both elegant and delicious. 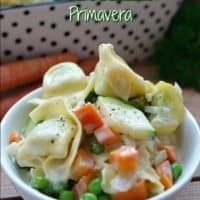 Guests will love the freshness of the vegetables and the creamy parmesan cheese sauce that adds delicious flavor to this pasta dish. Even the leftovers are amazingly yummy. When I make this meal, it’s always more than we need for just the two of us but having leftovers is always great because this is such a delicious meal that tastes great reheated. Cut the ingredients in half if you do not need this amount. One of the benefits of living in the same townhouse complex as my daughter and son-in-law is that I can call them up and share all of these delicious recipes with them, and they are loving having us close as well. I love to share food with others and this is a great recipe to share. Start off by peeling and dicing the carrots and dice the celery into small pieces, slice the zucchini and squash and cut the broccoli florets into smaller pieces. 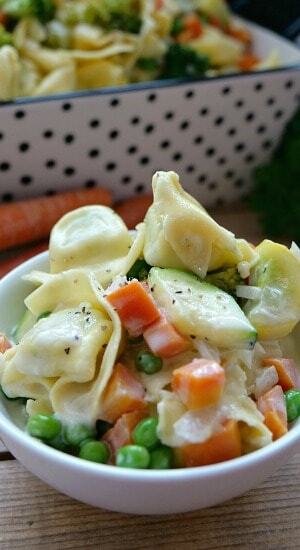 Place all the veggies into a bowl along with the frozen peas and set aside. Using a large sauce pan or dutch oven, melt butter over medium heat and sauté the onions and garlic until translucent. Add the vegetables and continue cooking for approximately 4-5 minutes. Pour vegetable broth into saucepan and heat up for a minute or two and then add the heavy cream and parmesan cheese. Season to taste. In a medium sauce pan, boil tortellini a minute less than the package directions. 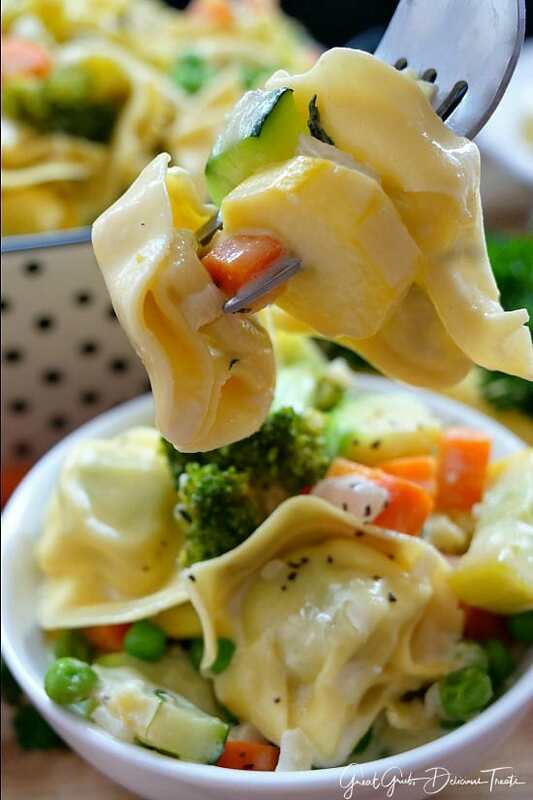 Drain and rinse the tortellini and then add to the vegetable mixture. Gently stir and enjoy! That’s it. Super easy, super quick and super delicious. Preparing the vegetables ahead of time will cut down on the time it takes to make this meal making it even quicker than approximately 30 minutes. Here are a few other delicious pasta recipes you can find on the blog: Classic Lasagna, Cheesy Ground Beef Pasta, Italian Sausage Penne Casserole, Cajun Shrimp Fettuccine Alfredo, plus many more…. and my kid’s favorite pasta dish ever, Farfalle with Sausage. 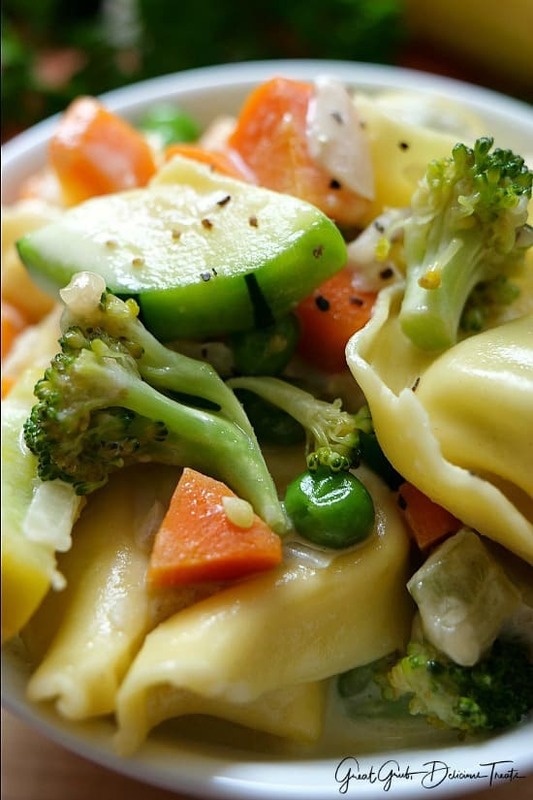 A creamy pasta dish loaded with vegetables and delicious spinach ricotta tortellini that the whole family will love. Peel and dice carrots and celery, slice zucchini and squash, cut broccoli into smaller pieces and place in a large mixing bowl. Set aside. In a large dutch over, melt butter over medium heat and sauté onions and garlic until translucent. Add vegetables and continue cooking for approximately 4-5 minutes. Pour vegetable broth into saucepan and heat up for a minute or two then add heavy cream and parmesan cheese. Season to taste. In a medium sauce pan, boil tortellini a minute less than the package directions. 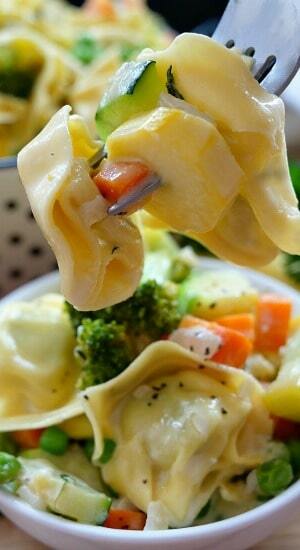 Drain tortellini and add to vegetable mixture. Gently stir and enjoy!